In 1947, Arnold Wolfers, a noted political scientist who had emigrated from Switzerland. a few years earlier to take the post of Master of Pierson College at Yale, and would later become director of the Center for International Relations, built a summer house on a wild and lovely stretch of ocean front at the end of Naskeag Point in Brooklin, Maine. 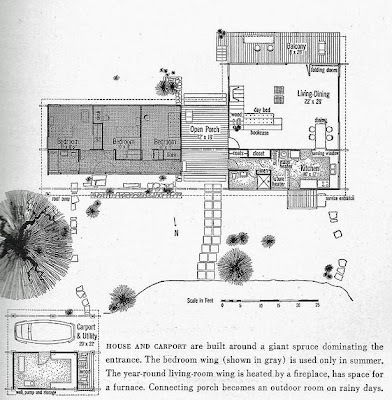 For their architects, the Wolfers went to Harvard, choosing The Architect's Collaborative (TAC), the socially idealistic partnership formed by Walter Gropius and seven other young architects, including Benjamin Thompson, who was simultaneously remodeling a large summer house for his mother and her partner in nearby Blue Hill (we'll follow the Thompson thread, an interesting story, in a future post). 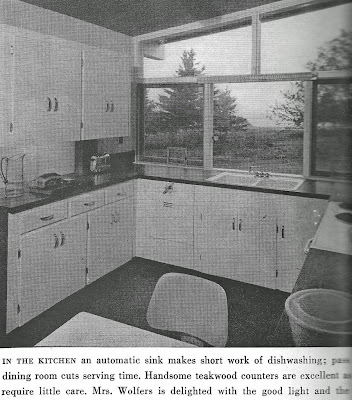 Dr. Wolfers and his wife Doris were a cosmopolitan couple, and this house, with its gull wing roof and glass window walls, was radical for the time and place. Locals and summer residents alike compared the house unfavorably to a factory or a school. Walls and ceilings of clapboards, painted the gray of a foggy day, further blurred the distinctions between outside and inside. 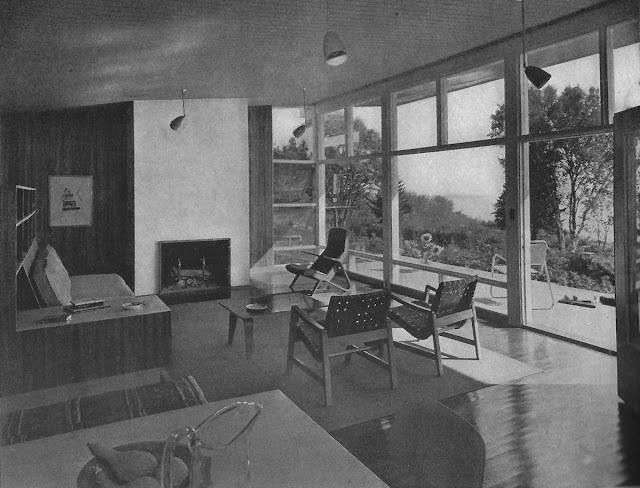 The house was furnished with examples by the modern masters, creating a seamless aesthetic. After retirement, the Wolfers moved full time to their Maine house. 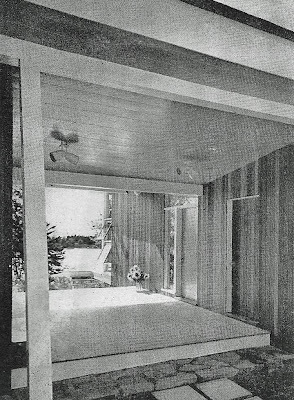 The open breezeway was enclosed, the house was doubled in length, adding a new sitting room and bedroom suites. The Wolfers brought their elegant traditional furnishings and art collection from their Washington house. Mrs. Wolfers, a fabric collage artist of talent, made the modern house her largest canvas, with wonderful objects from many centuries and cultures--french chairs, Italian brocades, Chinese porcelains, Greek bronzes, tribal rugs, modern paintings, all playing richly against the modernist framework of the house. I'm sorry I don't have pictures of the house in that era. The look recalled the deMenils in Dallas, and spoke wonderfully of a cultivated mind and discerning eye. The height of modernity, 1948. It was a simpler age. The floor was red marmoleum. I buy less expensive ties nowadays, too. I'M in Love again.,. If it's got windows I love it.. Fabulous..
What a beautiful place. A pity there are no photos of the interior at it's most personal. Nowadays the house seems not at all extreme but new things and changes often upset people. Thank you for sharing this with us... not only am I in love with the house, but I'm in love with your sweet story. Delightfully told. Glad you have an answer to the tie in the soup pesky issue. Funny you should mention red marmoleum. I am continuing to look for a kitchen flooring that can take real kitchen mess (not real wood, not tiles or stone) and keep coming back to marmoleum...red marmoleum! Do I dare? Blue, I'll ask around friends and see if anyone photographed. This house was one of the epicenters of social life up our way 25 years ago, so it would seem odd if no one had. Home Before---it's all in the mix! Personally, I think Marmoleum is one of the great materials---it can be bordered, inlaid, whatever, looks wonderfully naturally artificial, and I'd rather have it, aesthetically and practically over any number of the currently fashionable surfaces. I knew a wonderful room, stylish and grand, with, yup, a marmoleum floor inlaid with a wonderful compass rose. 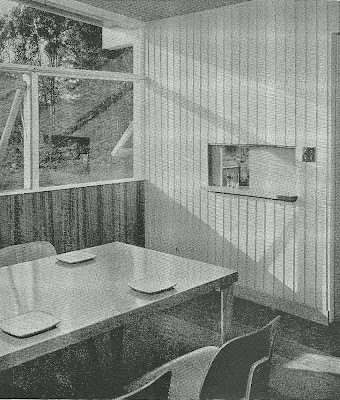 Gropius and cream of avocado soup...how many people can claim to have experience those two things in the same night? I love, LOVE this house. 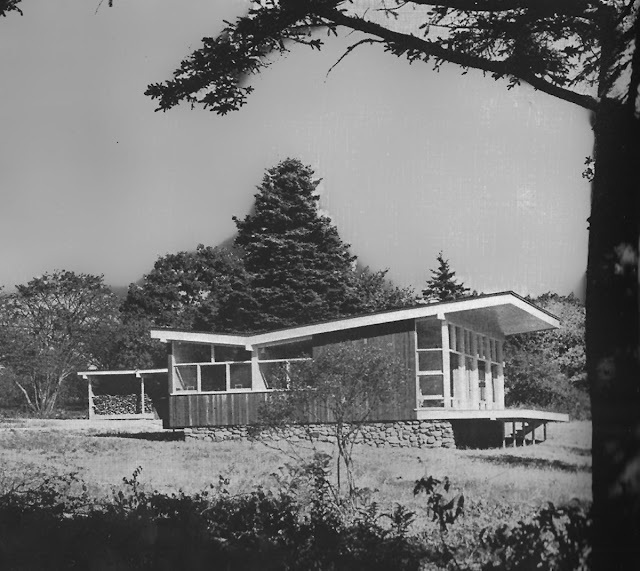 Modernist, and yet so in tume with Maine. Your dinner story brings back many happy memories. Doris was an equal-opportunity hostess, who seemed to enjoy mixing egotistical conservatives with open-minded liberals. Conversation was almost always very lively. And the food was excellent--from hors d'oeuvres to dessert. Doris was incredibly generous: the last 15 years or so of her life, she and I spent almost every Sunday morning in her back living room, drinking high-test coffee and talking about art, conversations of which I was a deeply grateful beneficiary. Doris gave me a rich education in art, featuring personal anecdotes about the many artists she had known. And, of course, she was an accomplished artist herself--her works in fabric are wonderful. I miss her greatly. Ah, the virtues of a tie clip! I hate to admit I've been the same situation before. Cuts one down to size. New York Social Diary is one of the Dilettante's favorite guilty reads, and now he can be read there too. Click on the pictures below to read some of Down East Dilettante's latest articles at NYSD. Thanks to David Patrick Columbia for the kind invitation to his Swell Party. You’re Invited to Enjoy “The View From Santa Monica” Esther McCoy Lecture This Saturday! copyright Brad Emerson. All rights reserved. Reproduction without express permission forbidden. . Simple theme. Powered by Blogger.